USA Today has a headline today What Wall Street is watching in Ukraine crisis and a big red strip across the top of the page with Breaking News Russia issues surrender ultimatum to Ukrainian forces in Crimea. History also shows that market shocks caused by war, terrorism and other fear-rattling events tend to be short-lived. In 14 shocks dating back to the attack on Pearl Harbor in December 1941, the median one-day decline has been 2.4%. And the shocks, which also include the Sept. 11 terror attacks and the 1962 Cuban missile crisis, lasted just eight days, with total losses of 7.4%, data from S&P Capital IQ show. The market recouped its losses 14 days later. If there is a consensus, it is probably that geopolitical risks have a tendency to go away. Think back over the last 24 years, going all the way back to the Kuwait crisis, and you will recall that markets sold off initially but recovered as the conflicts turned out either to be shorter, or less economically damaging, than they feared. Hence, while the markets have sold off today, the declines have hardly been substantial (between 0.8% and for the FTSE and 1.4% for the Dax at the time of writing). Professional organizations in the geopolitical risk space offer to provide information to companies operating in risk-prone areas or with vital interests in, say, natural gas markets globally. One of these is Stratfor, founded by George Friedman in 1996, with subscription services and reports for purchase by business and other organizations. For the interested, here is a friendly but critical review of Friedman’s supposedly best-selling The Next 100 Years: A Forecast for the 21st Century (2009). Friedman actually predicts the disintegration of Russia in the 2020’s, following a re-assertion of Russian power westward, toward Europe. Hmmm. Currently, Stratfor is highlighting the potential for the emergence of extreme right-wing groups in the Ukraine. This is a similar focus to one developed in an excellent article in Le Monde Diplomatique Ukraine beyond politics. I don’t want to comment too extensively on the US role in the Ukraine, or the inevitable saber-rattling and accusations that not enough is being done. Rather, I think it’s important to look at one particular graphic, presented initially by Business Insider and extensively tweeted thereafter. 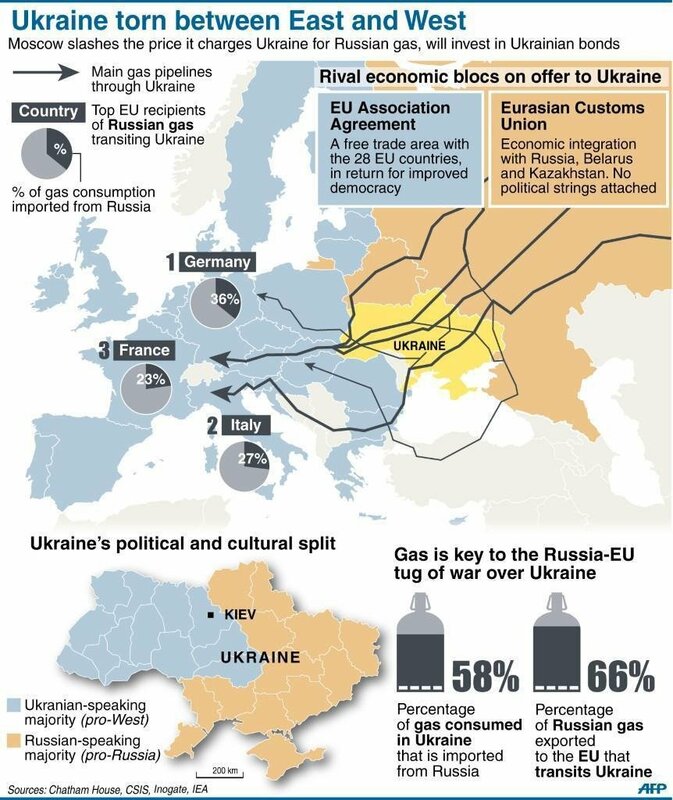 So from a purely predictive standpoint, it seems unlikely the United States can originate and see implemented significant economic sanctions against Russia – since then, clearly, Russia has the power to retaliate through its control of significant natural gas supplies for western Europe. The risk – plunging western Europe back into recession, again threatening the US economic recovery. Economic rationality may provide some constraints to wild responses and actions, but the low performance of many economies since 2009 creates a fertile environment for the emergence of hot-heads, demagogues, and madmen. So, what I guess I worry about is that the general geopolitical dynamics seem to be moving into greater and greater vulnerability to some idiotic minor event which functions as a tipping point. But then again, the markets may go forth to a new stabilization very shortly, and it will be business as usual, with more than a modicum of background noise from politics.